Bring a tropical look to your garden with the plumeria tree, which can grow in USDA hardiness zones 9 or higher. Gardeners prize the tree for its sweet-smelling, brightly colored blossoms. 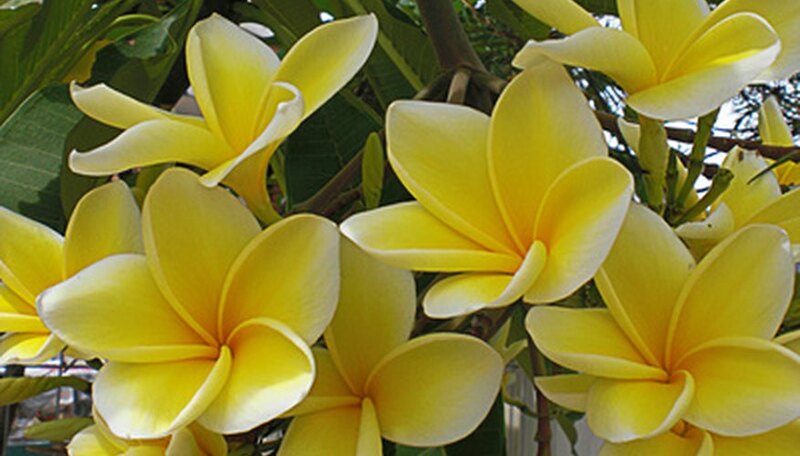 Though plumerias can be started from seed, propagating the tree via a cutting is faster and easier. Additionally, a cutting often will produce its own flowers within a year. Trees started from seed can take more than three years to grow blossoms, according to the University of Hawaii. Cut off the growing tip of an existing plumeria tree's branch. Make the cutting approximately 12 to 24 inches long. Snip off any leaves on the cut branch. Set the cutting in dry, cool room for two to three weeks to allow the cutting to cure and lower its chances of contracting diseases. Fill a 1 gallon pot with potting soil or combine equal parts of compost, garden soil and sand or vermiculite as an alternative. Plant the plumeria cutting in the pot. Bury its cut end in the soil with the cutting oriented vertically. Insert the cutting 4 to 6 inches deep, or as needed to make the cutting secure so it doesn't fall over. Dip the cut end of the plumeria branch in an indolebutyric acid-based rooting compound for faster rooting, according to the University of Hawaii. Place the pot in a sunny location. Water twice daily or as needed to keep the top 2 inches of soil moist. The cutting typically will take root within two months and will be signified by the emergence of new leaves on the top of the cutting, according to Texas A&M University.